“Angels walk amongst us…” Rick Moonbeam Darge wrote on GoFundMe. Darge created the crowdfunding page for a homeless man named James who cared for his dog Maya after she went missing. 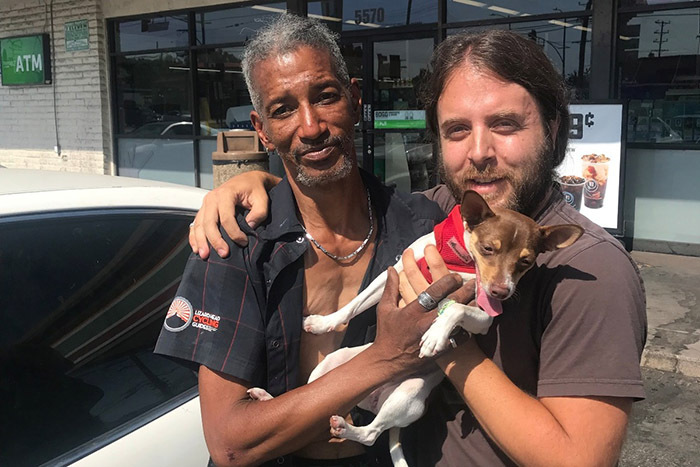 The 9-month-old rat terrier had run away from home and crossed paths with James who is living out of his car in East Hollywood. James, who does not own a phone, noticed the number on Maya’s dog tag and tracked down a phone to call Darge and let him know his dog was safe and in good care. “This angel man named James told me that his street name was coincidentally ‘Canine’. This man loves dogs and as soon as he got Maya, he fell in love. He’s been living out of his car with his pal Andy for months, just trying to get by. James recently lost his own dog a week ago and has been torn up about it ever since. When Maya ran away, it didn’t take her long to join the company of some nearby homeless guys setup near my office in East Hollywood. One of those guys was friends with James and knew how hurt he was, so decided to gift Maya over to him, I’m guessing so he could keep her forever. After a few hours, James pulled Maya’s harness off and noticed her dog tag with her name and my number on it. James didn’t have a cellphone so he had to wait until the next day to call me….